The heart-rending story of one man's struggle against forces conspiring to deprive him of rural Internet hit. Wireless Internet access cards are this seasons' 'new black.' We round up the options for cutting the ties that bind. Researchers probe fuzzy logic of relaxation with cuddly robot. The King lives on - in Tokyo - and he's an international sensation on the small screen. As ever greater numbers of non-Japanese investors move in to take over more and more distressed assets, we take a look at exactly who's got money to spend and why they're directing their efforts eastward. Are they in for a quick buck or looking to heal an ailing economy? 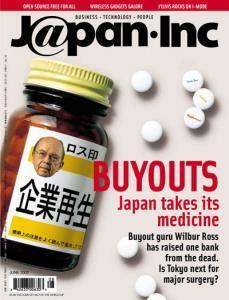 Kansai Sawayaka Bank was the first acquisition target for all-American takeover guru Wilbur Ross when its predecessor foundered in the aftermath of Japan's 1999 financial 'Big Bang.' KSB's fate has been seen as anything from foreign interference to an intriguing experiment. Alex Stewart surveys the lie of the land. The deal-making prowess of Wilbur Ross is known far and wide, but how has he slashed his way through the notorious Japanese red-tape jungles?And more importantly, why? Why are Japan's mainframe makers, brokerages and other big guns so interested in open source solutions these days? Sam Joseph takes us into a geeky world that is getting more attention from moneyed interests. South Korea's economy has rebounded from the verge of bankruptcy to rude health. Soichi Nakamura and Pascal Nguyen analyze the implications for Japan. With the World Cup in full swing and co-hosts Korea and Japan heading in opposite directions on the world's economic league tables, we read a few socioeconomic tea leaves. Top of the pops in the sushi world, retirement options and what to do with your spare time -- if you're Japanese.